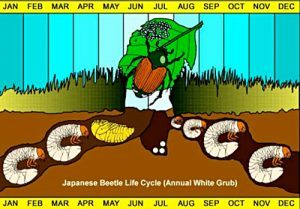 The Japanese beetle or June bug is a serious pest, especially to fruit baring plants like grapevines and berry bushes. My husband and I recently bought a 5th wheel motor home and have started traveling. We discovered Harvest Hosts, an online site that lists vineyards, historical sites and museums that will let you park overnight for free. In the last two weeks we have stayed at 5 wineries and 1 farm. Guess what they all have in common? Japanese beetles. We started doing some research and found that these beetles were first found in the United States in 1916, after being “accidentally” introduced. Until that time, they were only found in Japan and were not considered to be major pests. In the eastern States they are controlled by soil-inhabiting protozoans. Unfortunately for the Midwest region, there is nothing in the soil to keep these destructive beetles from mass producing. The beetle and the damage they cause is easy to identify. They are about ½ in size and metallic green and gold. 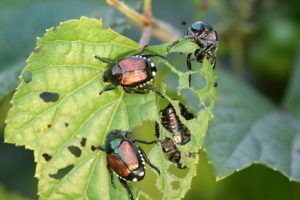 Vineyards and berry growers especially dislike the Japanese Beetles. Not only do they harm the root systems of plants, but by eating the leaves they damage the photosynthesis process. How? Leaves make chlorophyll, which in turn produces cellulose. The way they make chlorophyll is through the process of photosynthesis. During this process, sugar is created as a byproduct of the photosynthesis. So now because of the beetles, we have fruit that isn’t as sweet! We asked the vineyards what they were doing to control the beetles. Most said they have been using Sevin Dust and pyrethrin every two weeks. This can be costly and time consuming and if there is a heavy rain, worthless. So, we picked up the phone and called Brad the Bugman. Brad explained that the best way to control these guys was to use Beneficial Nematodes. Beneficial Nematodes are microscopic and live below the soil surface and like a moist environment. Looking like short non-segmented worms these voracious predators make their way through your lawn and garden looking for food. Nematodes do not harm worms, birds, plants or the environment, in fact they are part of the environment and are found the world over. When the nematode comes in contact with a pest the attack by entering through body openings or simply by boring through the body wall. Once inside the Nematode will release a bacteria that kills its host within 48 hours. They will feed and reproduce before exiting in search of fresh prey. Beneficial Nematodes are sold live on sponges that can be stored under refrigeration for a week or two before use. A few gallons of water is used as a carrying agent. This concentrate can be applied through a hose end sprayer, pump sprayer or with the use of a watering can. Container growers can mix a bucket full and dunk individual pots. Can be used inside on potted plants that have fungus gnat infestation. 1 million covers 3000 square feet, 6 million covers 1/4 acre, and 24 million covers 1 acre. So, there you have it. Save the grapes and berries to keep the sweet wines sweet and the Thunder Muffins sweeter! If you’ve found this article helpful please visit us at www.marchbiological.com.